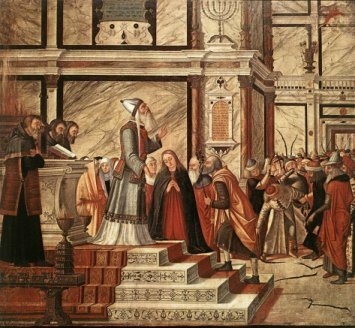 The story of the selection of Joseph as a husband is also featured in the apocryphal texts, and it is a rather complicated business. It was decided by drawing lots that Mary's husband should come from the tribe of Judah. Therefore the unmarried men of that tribe brought along their rods to the Temple to be placed in the Holy of Holies. It had been announced that when the rods were given back, a dove would fly from the one belonging to the future husband of Mary. (Or burst into flower, according to St. Jerome.) The rods were duly handed out, and, disappointingly, nothing happened. The priests were about to give it up as a bad job when an angel appeared and pointed out that they had missed one of the rods - it was much shorter than the others so they had overlooked it. This was Joseph's, of course, but, realising his age was against him, he had not bothered to point out that he hadn't got his rod back. The inevitable happened. The dove flew from Joseph's rod, and he was named as husband-elect of Mary. I indeed do not despise the will of God; but I shall be her guardian until I can ascertain concerning the will of God, as to which of my sons can have her as his wife. Let some virgins of her companions, with whom she may meanwhile spend her time, be given for a consolation to her. Joseph's sons are mentioned in other texts. The apocryphal History of Joseph the Carpenter says he was a widower, and had four sons and two daughters by a previous marriage. The companion virgins do appear in paintings of the marriage and the visitation. The next day, Gabriel appeared to Mary; the Annunciation. 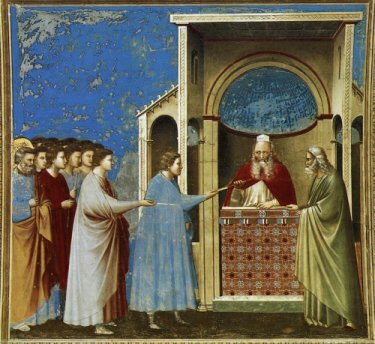 These two frescos by Giotto are from the Scrovegni Chapel in Padua; they show the would-be suitors handing in their rods, then praying that it will be them. 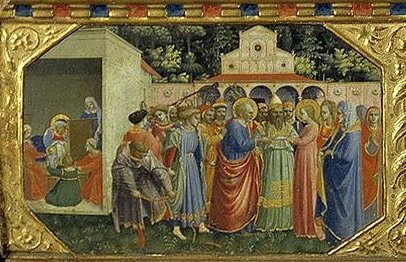 In this scene from the predella of the Annunciation in the Prado, (below left) Fra Angelico shows Joseph being presented to Mary while the other contenders petulantly break their rods. Carpaccio's painting (right) shows a similar scene. 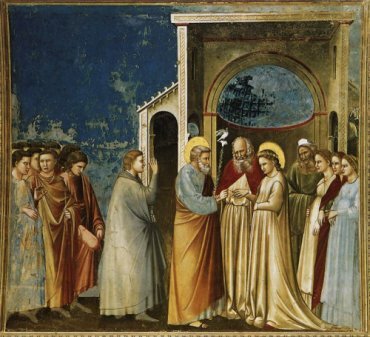 This event is often merged with the Wedding of the Virgin: see below. The time-scale is confusing. If Joseph returns nine months after the Annunciation, it doesn't allow much time for the marriage and the journey to Bethlehem. The marriage itself is not mentioned in the texts, though it is often celebrated in art. In fact, the ceremony we are familiar with today was almost certainly unknown at the time, and little distinction is made between the choosing of Joseph as husband and the marriage. 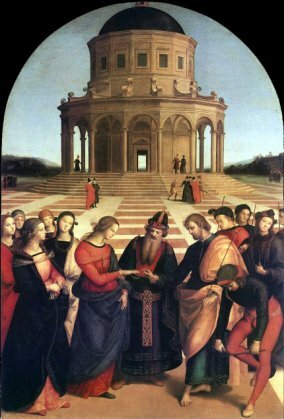 The well-known painting by Raphael is known as the Engagement of the Virgin. This fits the story, as a failed suitor is seen breaking his rod in the foreground, and the five virgins look on. 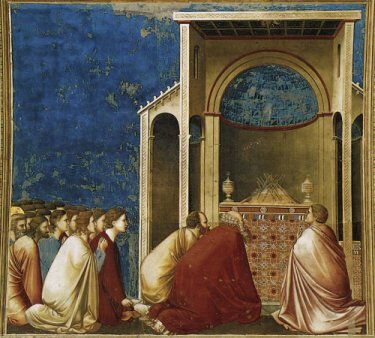 The version by Giotto from the Scrovegni chapel is known as the Marriage of the Virgin, but we see the dove appearing from Joseph's rod which supposedly took place at the engagement.